ALE have successfully completed the worlds heaviest jack up for Exxon Neftegaz Limited at the shipyard of Daewoo shipbuilding and Marine Engineering Co. Ltd in Korea. With a final jacking weight of 42,780te the topside is the heaviest load ever jacked. 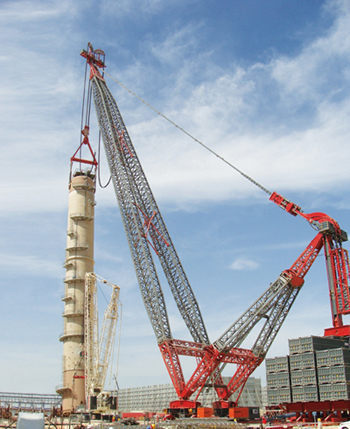 ALE utilised the innovative Mega Jack System at 60,000te capacity to complete the project. The piece will eventually be located in the Arkutun Dagi field off the east coast of Russia; the development is expected to be the largest oil and gas production platform in Russia where the first oil is scheduled to be produced next year. Kees Kompier Executive Director at ALE said: “This pioneering project is a great achievement for ALE and the Mega Jack which was created by our research and development team and engineers. The load is nearly double the weight of the previous heaviest load which is a great accomplishment for the company and really shows the capabilities of the Mega Jack.